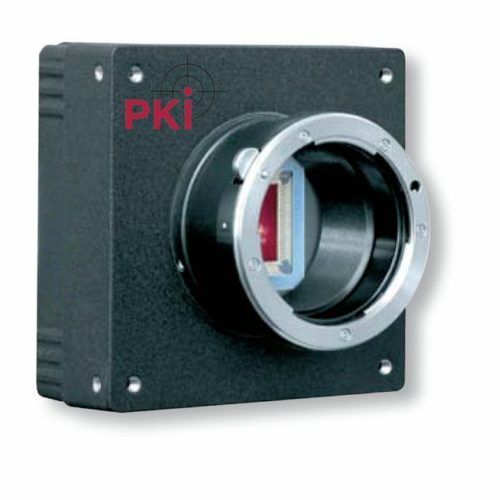 The PKI 5630 high speed camera allows an exact motion analysis. In contrast to standard video cameras, the PKI 5630 is up to 20 times faster. Thanks to the high definition resolution of 1280 x 1024 pixels in case of progressive scanning, no details get lost. Depending on the application, the PKI 5630 is available with a CMOS monochrome or colour image sensor. The signal is made available at an interface acc. to camera link standard and can be recorded and processed on the connected PC. The module has a C-type or F-type lens mount and can thus be used with standard lenses. The PKI 5630 is used in all places where motion sequences must be reproduced distinctly, e.g. ballistics tests, packaging machines, flow conditions, etc. Miscellaneous: Higher frame rates on request.